David completed the Professional Golf Management Program at New Mexico State University and awaits his membership into the PGA of America. David began at GreenToTee Golf Academy in 2009. 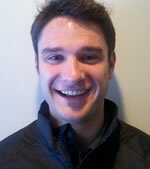 David works in all aspects of golf where he helped develop and runs the junior programs with the PGA professional team. He works with Adults that want to improve their games, And he prepares junior golfers to make their high school golf teams. David understands everyone has unique yet common physical characteristics. Your unique body type requires your swing to built for you rather than applying one "universal, correct swing." David strives to help you understand the basic fundamentals of "the" swing (setup, alignment, swing dynamics) so that you can learn how to practice effectively. By building your understanding, you can build a base and he can coach you for success . David played varsity golf 4 years in New Hampshire with numerous top ten finishes in the Northeast Titlist Junior Tour tournaments. He then went on to play and participate in New Mexico State University's Professional Golf Management Program. David will help you reach your golfing goals. "Competitive golf is played mainly on a five-and-a-half-inch course.. the space between your ears"